Some people come to the desert for relief from allergies. You'll find people who will tell you that their allergies got worse, and some who'll tell you that their allergies got better. Some people never had allergies before, but then suffer from allergies after they move to the desert. What causes so many people to have allergies in the desert? The usual suspects: Pollen, dust, and pollution. About 35% of the people who live in the Phoenix area experience some degree of Allergic Rhinitis—commonly known as hay fever. If you have hay fever, it means that your body is reacting to pollen or mold by releasing histamines and other chemicals that cause sneezing, fluid in the eyes and nose, congestion and itchiness. Generally, pollen from plants with brightly colored flowers do not trigger allergies—the birds and the bees take care of those. More pollen problems arise with trees, grasses, and weeds. As the growing season in Phoenix is year-round, allergies never seem to stop for some. Contrary to some reports that it is non-native plants that are the source of suffering in Phoenix, but native plants cause allergies, too. Ragweed is one of the most common allergy-causing plants in the United States and Greater Phoenix has over a dozen native species of ragweed. Tumbleweeds may be fun to look at, but that Russian Thistle should be avoided if you have allergies. When landscaping your yard, try to avoid all grasses and put in desert landscaping instead of grass. Make sure you attack weeds quickly as they sprout, which they will even in desert rock. Better yet, use a pre-emergent to kill them before they grow. Phoenix is a desert: it's dry and doesn't rain very often—Phoenix is experiencing a drought that has lasted over a decade—but there is still agriculture and developments, highway construction, and driving on unpaved lots kicking up that dust. Vacant lands are covered with dust. 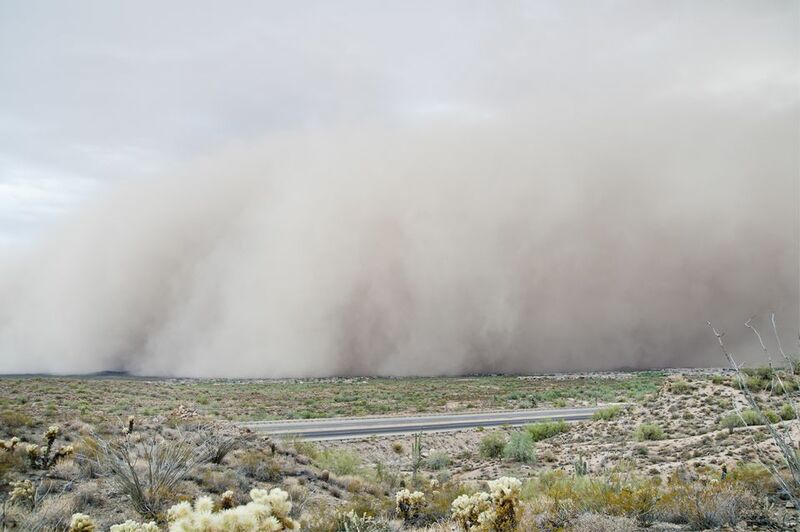 During monsoon and a few other times of the year, there are dust storms and dust devils. For people with allergies, that's not good news. Dust can certainly have an effect on your respiratory system, especially if you have asthma. Coughing, wheezing and teary eyes might be the immediate symptoms, but Valley Fever could be just around the corner. There are dust-related allergies. Dust mites eat the microscopic skin dander found on people and animals, then leave droppings. Even a clean home can have dust mites. The inhaling of dust mite droppings may produce allergic reactions. The humidity in the Phoenix area is usually pretty low, and that's a good thing because dust mites thrive in higher humidity. If you use an evaporative cooler, be aware that you are creating moisture in which dust mites like to live. If you have allergies to dust, the message here is clean, clean, clean. Don't just move the dust around! Here are some tips to reduce dust inside your home. Use wet mops and wet dust cloths, never dry ones. Keep pets out of the bedroom, and certainly off the bed. Cover pillows, mattress and box springs with dust-proof casings. Reduce the amount of carpet in the house. Use throw rugs that can be regularly washed and dried. Don't use feather pillows or comforters. More development, more people, more cars, more concrete means more problems with our air—as the population grows, the air gets worse. The Phoenix area sits in a valley and, without a lot of rain or wind, the pollutants tend to just hang around in the valley making it uncomfortable for many residents who are sensitive to it. Eye irritation, runny nose, sore throat, coughing, and shortness of breath may result on days when pollution in the area is bad. People with asthma and other respiratory illnesses are especially at risk on those days. Air pollutants that we have in Phoenix are usually nitrogen oxides, ozone, carbon monoxide, and particulates. Cars account for most of the problem, and that pollution is worse in the winter when cold air traps the pollution in the Valley. Air pollution advisories will be issued when ozone levels or particulate concentrations are high. If you have allergic reactions to higher levels of pollution, you may experience coughing, wheezing, shortness of breath, and/or fatigue. Here are some tips for you. Limit outdoor activity on air pollution advisory days. The very young and very old should stay inside on air pollution advisory days. Don't participate in strenuous activity on those days. Filters and room air cleaners can help reduce indoor particle levels. Don't smoke, and if you do, don't do it in the house. Don't burn wood in your fireplace. Try not to drive on unpaved roads. If you have to, close your vents and turn on the a/c to reduce the amount of dust coming into the vehicle. You can see the daily air quality report and next day forecast online, provided by the Arizona Department of Environmental Quality. You can even get the air quality notifications by email. Note: None of the information here is intended to be medical advice. The details provided here are general, and factors relating to pollen, dust, and pollution will affect each person differently. Consult a doctor to diagnose and treat any medical condition.